Of note, a capsule formulation of cabozantinib (Cometriq) was approved by the FDA in November 2012 for patients with metastatic medullary thyroid cancer.9 Cabozantinib capsules and cabozantinib tablets have distinct package inserts. 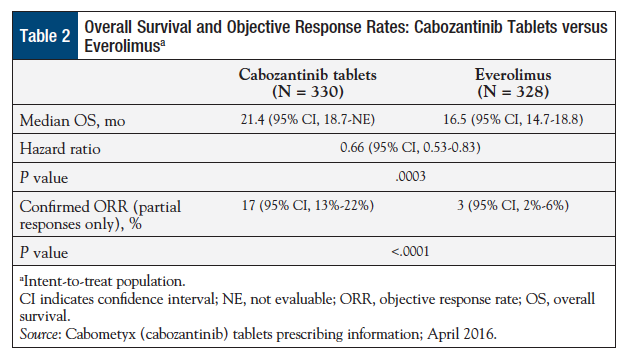 Significant improvements in PFS, OS, and ORR were reported with cabozantinib tablets compared with everolimus in the METEOR study.7,8 The median PFS was 7.4 months with cabozantinib and 3.8 months with everolimus (Table 1). The OS was 21.4 months with cabozantinib and 16.5 months with everolimus, and the ORR was 17% versus 3%, respectively (Table 2). National Cancer Institute. SEER stat fact sheets: kidney and renal pelvis cancer. http://seer.cancer.gov/statfacts/html/kidrp.html. Accessed July 27, 2016. American Cancer Society. Cancer facts & figures 2016. 2016. www.cancer.org/acs/groups/content/@research/documents/document/acspc-047079.pdf. Accessed July 27, 2016. National Cancer Institute. Renal cell cancer treatment (PDQ)–health professional version. Updated April 18, 2016. www.cancer.gov/types/kidney/hp/kidney-treatment-pdq. Accessed July 27, 2016. Geynisman DM, Hu JC, Liu L, Tina Shih YC. Treatment patterns and costs for metastatic renal cell carcinoma patients with private insurance in the United States. Clin Genitourin Cancer. 2015;13:e93-e100. National Comprehensive Cancer Network. NCCN Clinical Practice Guidelines in Oncology (NCCN Guidelines): kidney cancer. Version 3.2016. May 26, 2016. www.nccn.org/professionals/physician_gls/pdf/kidney.pdf. Accessed July 27, 2016. US Food and Drug Administration. Cabozantinib (cabometyx). April 25, 2016. www.fda.gov/Drugs/InformationOnDrugs/ApprovedDrugs/ucm497483.htm. Accessed July 22, 2016. Cabometyx (cabozantinib) tablets [prescribing information]. South San Francisco, CA: Exelixis; April 2016. Choueiri TK, Escudier B, Powles T, et al; for the METEOR Investigators. Cabozantinib versus everolimus in advanced renal-cell carcinoma. N Engl J Med. 2015;373:1814-1823. US Food and Drug Administration. FDA approves Cometriq to treat rare type of thyroid cancer. Press release. November 29, 2012. www.fda.gov/NewsEvents/Newsroom/PressAnnouncements/ucm330143.htm. Accessed July 22, 2016. Exelixis. Exelixis announces FDA approval of Cabometyx (cabozantinib) tablets for patients with advanced renal cell carcinoma who have received prior anti-angiogenic therapy. Press release. April 25, 2016. http://ir.exelixis.com/phoenix.zhtml?c=120923&p=irol-newsArticle_print&ID=2161051. Accessed July 27, 2016. Exelixis. Accessing Cabometyx (cabozantinib) tablets. 2016. https://hcp.cabometyx.com/downloads/CABOMETYXSpecialtyPharmacyandDistributorFlashcard.pdf. Accessed September 12, 2016. ClinicalTrials.gov. Cabozantinib. Search results. https://clinicaltrials.gov/ct2/results?term=cabozantinib&Search=Search. Accessed July 22, 2016.